iPads have been used in all sorts of medical and therapy style situations so it is quite clear that there is plenty of applications available for the iPad to be used for good. Today though we learned of a new way the iPad is being used for good, a zoo in Milwaukee has begun using iPads to interact with orangutans in a variety of ways. Animals like the orangutan have been interacting with humans for quite some time and we know that they’re incredibly good at adapting, but nobody expected them to use an iPad successfully. 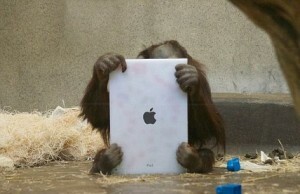 Zoo workers say that the animals have absolutely no problem using the iPad and the touch screen interface. It is truly amazing to see such interaction and researchers say that it may make it possible for the iPad to be used for extensive intelligence research in animals in the future.